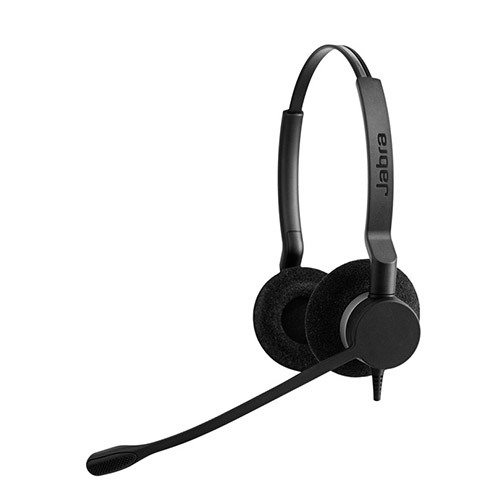 The Jabra BIZ 2300 headset is the comfortable headset you have been looking for! The low squeeze pressure headband design is so light, you'll barely notice you're wearing it. 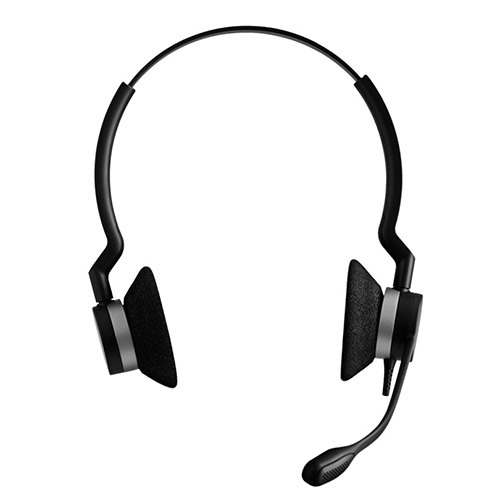 The microphone and headphone quality is everything you expect from a professional call-center grade headset and more! Wideband Audio - Enjoy high-definition sound with HD Voice and get crystal clear, intelligible communication. You get life-like, vibrant conversations where you can focus on the content and don"?t have to struggle to understand what the person on the other end of the line is saying. 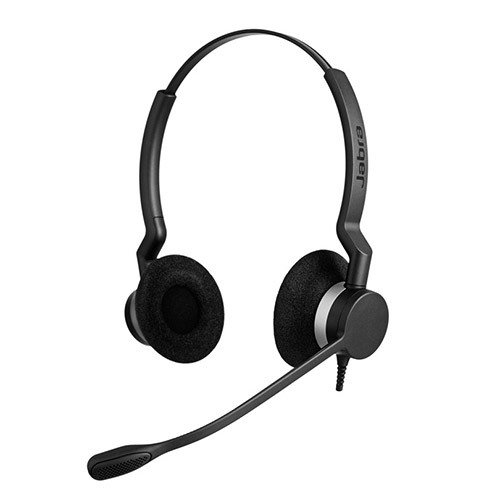 Noise Cancelling Microphone - Noise-cancelling microphones reduce unwanted background noise and are ideal in crowded and noisy, open office environments. 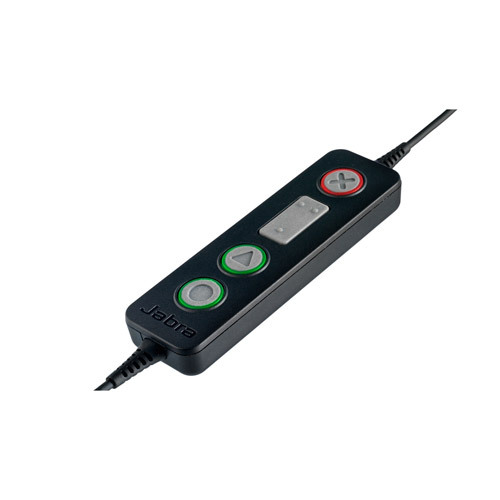 Air Anti-Shock Microphone - When the microphone is close to the mouth of the user, there is a risk of respiratory noise. To reduce it, the microphone is designed aerodynamically, and with many small holes instead of a larger hole. In addition, there is included foam on the inside of the microphone. Overall, it reduces the penetration of air shocks to the microphone, which optimizes the call quality. Kevlar Reinforced Cord - Cords made with Kevlar help to deliver performance and value to end user by providing excellent robustness, fatigue resistance and durability, which in total contributes to the cords overall quality, and by that reduces the headset"?s total cost of ownership. FreeSpinMicrophone - The unbreakable 360 swiveling boom arm ensures that end users always have the option to customize the location of the microphone optimally in relation to current needs without exposing the boom arm to any break risk. Talk in Comfort - Assure total comfort with a range of styles that match your individual needs and personal fit requirements. Our light, ergonomically designed frames along with soft ear cushions, adjustable headbands and microphone boom will guarantee that your headset will be comfortable all day long. Crystal Clear Sound - Clear high-fidelity sound is essential for a good conversation not to mention call efficiency and accuracy. Digital Signal Processing (DSP) in Jabra audio devices will remove background noise and echo as well as protect the user against sudden high peaks in volume. 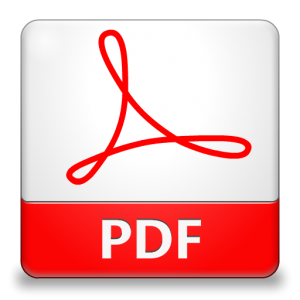 Remote Asset Management - Configure and implement the company"?s audio devices 100% remotely from one central point. 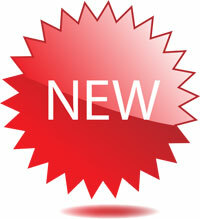 You get the latest features and functionalities on one go with Jabra Xpress, a web-based solution. Hearing Protection - Jabra SafeToneincludes Jabra PeakStopand Jabra Intelli-Tone?, the enhanced hearing protection technology. Benefit from clear, crisp and automatic limitation of average volume exposure during your workday according to acoustic standards and regulations. A feature that offers you significant confidence, safety and comfort.